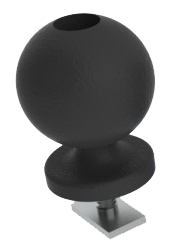 Use your favorite RAM ball mount rod holders in the Frontier Freedom Track with the Screwball. Twist it to tighten to the Track, then add on your favorite rod holder. Available with a 1" or 1.5" ball.